The row-based Liebert APM is a transformerless, on-line UPS that allows quick and easy capacity increases with modular power scalability - no additional floor space required. The UPS operates with high efficiency - up to 94% at loads of 50-100%. 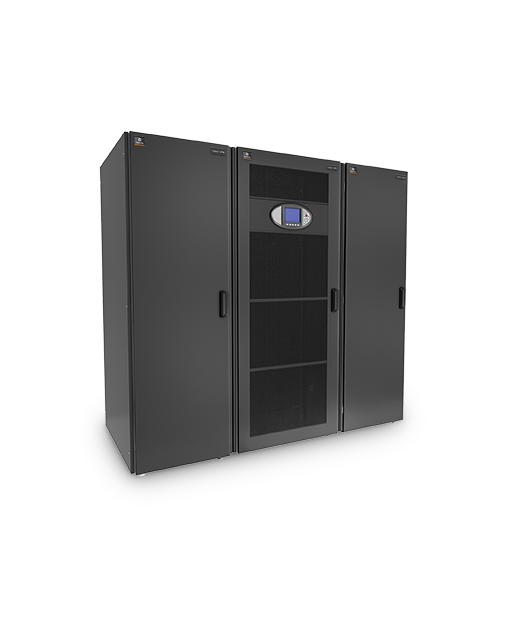 The row-based Liebert APM is a transformer-free, on-line uninterruptible power supply (UPS) that allows quick and easy capacity increases with modular scalability--with no additional floor space required. Liebert APM operates with high efficiency--up to 94% at loads of 50-100%. The 208 Volt, three-phase Liebert APM is available in two models, expandable with modular power scalability: Liebert APM 45kVAkW frame size is expandable from 15 to 45kVAkW, with up to 45kVAkW of capacity, or up to 30kVAkW of capacity with a 15kVAkW module for redundancy. This frame size includes internal batteries, and is compatible with the matching external battery cabinet and the optional Liebert APM bypass distribution cabinet (BDC). Liebert APM 90kVAkW frame size is expandable from 15 to 90kVAkW, with up to 90kVAkW of capacity, or up to 75kVAkW of capacity with a 15kVAkW module for redundancy. This frame size requires the matching external battery cabinet, and is compatible with the optional Liebert APM BDC bypass distribution cabinet.